Canon EOS 1200D is the successor and an upgrade of EOS 1100D. One of its most notable features is the new app for iOs and Android. The app walks you through the key functions of the camera. It also provides you with tips and short tutorials that teach you how to use the Camera. The app also inspires you to take different types of pictures. This is a wide angle and fisheye lens that was released in the market in the year 1987. It has a number of great features such as a focal length of 15 mm and an aperture of f/2, 8. It has a sensor of type APS-C (1.6 xs). The cool thing with it is that it’s light weight; therefore, it won’t add a lot of weight on your camera. This is a normal zoom lens with a focal length of 28-135 mm and an aperture of F/3.5-5.6. Just like the other lenses, it’s designed to work with all types of camera sensors; therefore, you won’t be required to buy a new sensor. The lens weighs 540 grams; therefore, you will be carrying a total of 1020 grams (including the weight of camera). This isn’t too much thus you can easily carry it around. The lens incorporates USM (Ultrasonic Motor) and FTM (Full Time Manual) focusing. These two features make the unit fast, quiet, and very accurate. The cool thing is that the lens doesn’t change its length when focusing. If you take good care of the lens it will last for a long time. The good thing with it is that it’s small and quite light. This makes it feel well balanced on your camera. Two of the most attractive features of this lens are: an excellent focal length range and an IS system that works perfectly. The lens also has an excellent image stabilizer which allows you to take high quality images. The unit also allows you to easily zoom the images that you want to capture. These are four of the best lenses for your 1200D canon camera. For ideal results you should buy the lenses from a reputable store. Photography seems to be gaining popularity and this is a thing of joy especially as this form of art brings out some creativity. The huge acceptance has been met with corresponding influx of different camera types and photography kits into the market and different brands are leveraging on this opportunity to develop different products to suit all levels of photographers from beginners to the experienced persons. A brand that has continued to make name for itself is Canon and the Canon 1200D is no exception to the class. The features of the camera have been perfectly designed to cater to all classes of camera users and the novice can actually feel like a professional after using this piece. Sharp images and visual clarity are just some of the many features that distinguish this product from its peers and its features far surpass the Canon 1200d price. It is followed by the launch of the EOS companion app that helps the 1200D users as they make their way through the photography world. The 18MP sensor is just a tip of the iceberg from the other features of the camera which are discussed below. The camera allows for high resolution photos that make it possible for you to get the best of photography regardless of the time of the day. The camera kit is equipped with a wide range of ISO of 100 to 6400, that be expanded to up to 12,800. This is definitely one of the commonest points found on any canon 1200d review. The lens, built-in flash, single-lens reflex, all come together to provide users with the best of pictures. It has a dust delete feature that ensures your photo comes out dust-free and clear. Not too many cameras can boast of a CMOS image sensor of 22.3 x 14.9 mm. Photography just got taken to another level with the Scene Intelligent Auto Mode that allows for the perfect photography experience as the DSLR immediately goes on auto-pilot as this mode is selected. The scene is recognized and based on such factors as the contrast, color, and brightness, thanks to the EOS 1200D kits. A browse through the internet will reveal canon EOS 1200d reviews that will definitely tempt any lover of photography. If there is one feature that would entice many beginners to this camera, it is the creative feature that comes with Fish-eye effect, Soft focus, Grainy Black and White, Miniature, and the Toy camera effects. With the Canon 1200D, one wonders what can come next. The Canon 1200D price in Delhi is fairly affordable too. This is a MUST BUY from me. There is absolutely no denying that Canon cameras are superb. They boast fantastic features, top quality lenses, and of course a support system which is second to none. All of this, as you may expect comes with a price. That being said; if you purchase a top quality Canon camera then you are pretty much set for life. For those who want a decent camera but who do not have that much of a budget to play around with then I really do suggest you take a little peek at the Canon 1200D price. 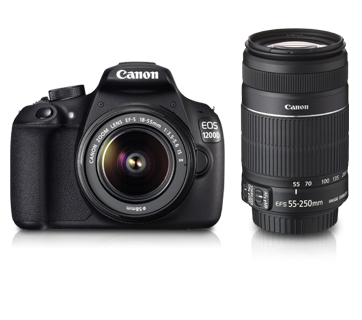 This is the most basic Canon digital camera in their DSLR range, however that does not mean that it is not good. In fact; the quality of the Canon 1200D actually comes close to what other manufacturers are trying to peddle for a far higher cost. Now; I could bog you down with specification after specification with the Canon 1200D. For example; I could tell you that it boasts a APS-C CMOS Sensor, a Digic 4 Processor and a 63-zone IFCL exposure monitoring. However let’s be honest; could you really tell me what most of that meant? Of course you can’t. Neither can the vast majority of professional photographers out there. All you need to know that it means that the unit is remarkably good. Features that you could most likely understand include the following: A 3-inch LCD Screen: There is no need to peer through that cumbersome viewfinder when you are using the Canon 1200D. You can just look at the crystal clear screen and line up your shots that way. All features can be easily adjusted through this screen. 3 FPS Continuous Shooting: Ideal for shooting sports where you may not be able to capture the perfect frame ‘manually’. Just hit that shoot button and it will capture three shots in rapid section. Stainless Steel Chassis: Just because the Canon 1200D price is fairly low does not mean that it is built well. Most other units at this price tend to have plastic chassis in place. Straight away this tells you that you are getting something that is top quality. 1080p HD Video: Yep; you heard me right. With this unit you will be able to record high definition videos with ease. The sound quality compared to similar units on the market is superb too! Of course; when you buy a Canon 1200D you are not just limited to the supplied lens. If you really wish to get creative with your shots then you will be pleased to know that ANY Canon lens available right now is compatible with this unit. This menas that once you purchase you are well and truly ‘set for life’. So; should you purchase a Canon 1200D? You bet your bottom dollar that you should! If you read any Canon 1200D review out there you will find that time and time again it is praised for the amount of features that are packed into what is really a budget unit. Unless you are taking professional photographs for a living then you really do not need anything else. The Canon 1200D price is fairly affordable too. This is a MUST BUY from me.